Conflict is good – five ways to make it even better! From the moment we wake up, we can be – and often are – in conflict with others. With our family members over how the day will go, with team members about the best next step on a project, with our manager over how to implement a new process, with colleagues about budget issues, with the person on line in front of you who is taking too long to order…the list goes on. Conflict is unavoidable and generally unenjoyable. And if mishandled it can negatively impact the results we’re trying to achieve and ruin our day…or our week. But conflict is not a bad thing, even though it feels so bad. In fact, it’s necessary and important. It brings out ideas that might not get thought of and strengthens proposals before they’re proposed – but only when it’s handled in ways that heighten the positives and lessen the negatives. So how do we work through conflict in a way that works? Remember what you really want – We can get so caught up in the fight that we forget what we’re fighting for. And sometimes we’re fighting against each other, without realizing we’re fighting for the same thing. It’s important to be clear, and to clearly share, what it is we really want and need. So that we remember and other people know. Take a step back – Many of us are driven to react immediately, if not sooner, to conflict, when what we (or the other person) really need is to count to ten – or one hundred – and pause…so that we can respond and not just react. So that we can be Thoughtful and take a next action or share a next word that will help cool the conflict so that we can find a solution. But not too far back – Those of us who aren’t driven to immediate reaction might be driving as far away as we possibly can. That doesn’t help either. While it’s important to not react in a fit of anger, it’s also important not to disengage entirely. Stay present, even if you step out of the room to cool down. Don’t ignore or avoid the conflict – deal with it or it will never go away. Get in their shoes – One of the most effective ways to dissolve conflict is to see it from the other person’s perspective. To stand in their shoes. Why do they want what they want? What are they facing? What pressure are they under? What’s important to them? What’s their experience? When you can see and understand a situation from your “opponent’s” point of view, you can move away from taking things personally and be more willing to meet them in a place that may work for both of you. Get on the same side of the problem – The most effective way to solve a problem is to get together to solve a problem. Instead of fighting over whether there is a problem, or what the problem is, or whose fault it all is, or who should give in first – when you can work with someone to solve the problem (rather than against them to win) you have more chance of figuring things out and coming up with the win-win solution that meets most needs. 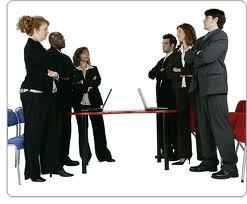 Conflict is unavoidable and usually unenjoyable, but it can be handled well and it can yield great results. What works best for you to work through conflict? Please leave a comment to share. For support in working through conflict, contact Lisa at lkohn@chatsworthconsulting.com. Definitely awesome, as a tool for any conflict management. Great article to read! Restating what the other person is saying so they know that you heard what they had to say is a good first step. It also clarifies your own thinking. Next, respond to the other’s point of view with your own take, being sure to respond in an open, honest and respectful way. No need to get on a high horse. Just state your position in a calm, rational way and throw in a smile too! Then you can both negotiate a solution that meets a middle ground. Or…maybe one of you will come across to the other side. Thank you Susan. You’ve mapped out a great way to work through conflict to a hopefully positive outcome. Thanks Steve. We agree (and teach) that conflict is good and necessary. It often brings out the best ideas and strongest results – when its managed effectively. Thanks for sharing! !